Make a bold statement outdoors by displaying your foliage in these rugged concrete planters. Providing a solid safety barrier and hydration system, these planters help prevent exposed roots from trees and shrubs. 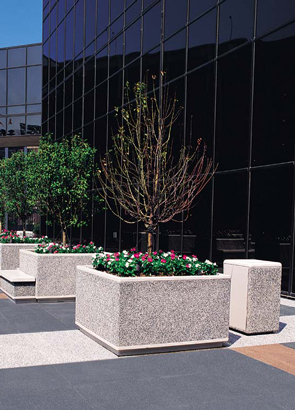 These precast concrete planters are available in an Exposed Aggregate, Weatherstone, and Smooth Stained Acid Wash finish. Constructed with 1/4" rebar, these precast concrete planters meet all ASTM C150-07 and C31 standards. Add the optional reservoir system which will extend plant lifespan while reducing the frequency of watering.